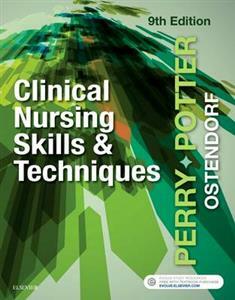 Get the best skills guidance on the market with Clinical Nursing Skills & Techniques, 9th Edition. Known for its clear and comprehensive coverage of over 200 basic, intermediate and advanced skills, this widely respected, bestselling text features nearly 1,000 full-color photographs and drawings, a nursing process framework, step-by-step instructions with rationales, and a focus on critical thinking and evidence-based practice. This edition also includes new coverage of patient-centered care and safety guidelines, an enhanced emphasis on QSEN core competencies, and an expanded clinical focus with specialized Clinical Debriefs, Teach-Back, and sample documentation throughout. Written by the highly respected author team of Anne Griffin Perry, Patricia A. Potter, and Wendy Ostendorf, this text offers all the guidance and tools you need to perform nursing skills with complete confidence! Comprehensive coverage includes 211 basic, intermediate, and advanced nursing skills. Coverage of QSEN core competencies incorporates the areas of delegation and collaboration; reporting and recording; safety guidelines; and teaching, pediatric, geriatric, and home care considerations into lessons. UNIQUE! Using Evidence in Nursing Practice chapter covers the entire process of conducting research, including collecting, evaluating, and applying evidence from published research. Expert team of authors and contributors include some of the most respected individuals in the nursing field. UNIQUE! Unexpected Outcomes and Related Interventions sections highlight what might go wrong and how to appropriately intervene. Framework on the five-step nursing process gives context for specific skills and their role within overall client care. Streamlined procedural guidelines format makes it easy learn and review basic nursing skills. Clinical Decision Points within skills address key safety issues or possible skill modifications for specific patient needs. Rationales for each skill step incorporate the latest research findings and explain why steps are performed in a specific way, including their clinical significance and benefit. Video clip icons indicate video clips that are related to skills and procedures in the book and related lessons in Nursing Skills Online. Online checklists and video clips may be downloaded to mobile devices. NEW! Clinical Debriefs are case-based review questions at the end of each chapter that focus on issues such as managing conflict, care prioritization, patient safety, and decision-making. NEW! Streamlined theory content in each chapter features a quick, easy-to-read bullet format to help reduce repetition and emphasize the clinical focus of the book. NEW! Sample documentation for every skill often includes notes by exception in the SBAR format. NEW! SI units and using generic drug names are used throughout the text to ensure content is appropriate for Canadian nurses as well.